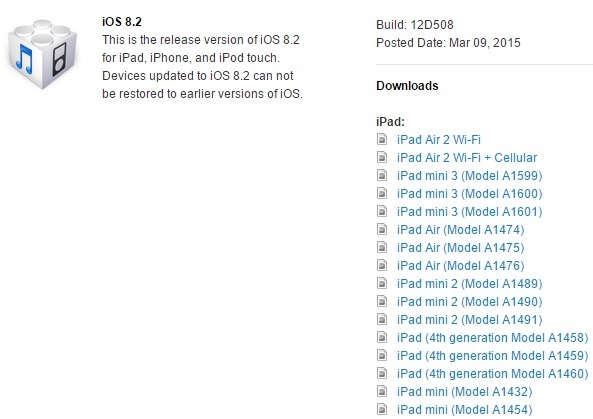 As announced at the event today, Apple has just released the iOS 8.2 update for iPhone, iPad and iPod touch devices and it is now available for download. The update brings several new features, improvements and bug fixes for all devices. The software update also brings support for Apple Watch to iOS in addition to improvements to the stock Health application. If you have an iOS 8 supported device then you can download the update via over-the-air through Settings up, or download the IPSW directly using the links below. The iOS 8.2 update also packs stability improvements for stock apps including Mail, Maps, Music and more.